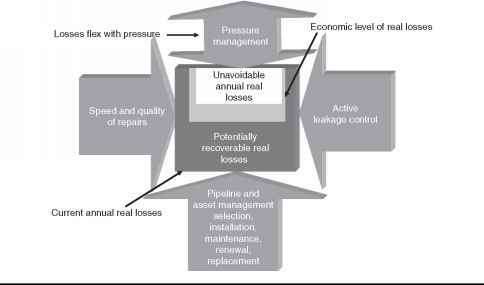 Modeling components of apparent losses has been done in many forms for many years. One example of apparent loss modeling is the attempt to quantify the volume of water not registered due to customer meter underregistration. However, in recent years component analysis of apparent losses has been approached in a similar manner as the methods of real losses modeling; where components of apparent loss are shown as multiples of an unavoidable annual volume. In Table 10.5, first attempts at a component analysis model for apparent losses can be seen. amount of apparent loss that a water utility would suffer in spite of enacting all reasonable and effective apparent loss control activities. Similar to the infrastructure leakage index (ILI) that assesses real loss standing as the ratio of current real loss volume over the unavoidable annual real losses (UARL) (See Chap. 7) an apparent loss index (ALI) would be the ratio of the current apparent loss volume in the water audit over the UAAL. However, in lieu of a reliable UAAL measure, the team's interim recommendation is that 5% of the metered consumption be assumed as a reference value for apparent losses. The authors feel that this may be high for water utilities in developed countries, which typically have good customer meter management and where buildings do not have roof tanks which present the opportunity for very low flows that pass unregistered through many water meters. (See Sec. 12.4.) These utilities typically also have reasonable policies and safeguards that prevent exorbitant unauthorized consumption. Therefore the 5% assumption may be high in developed countries, but reasonable for developing countries. The Water Loss Task Force is actively engaged in work to develop a set of apparent loss performance indicators and further information will be made available by the IWA team as research progresses.